Iran has made great contributions to Muslim architecture culminating in the introduction of the cylindrical minaret form and the four-iwan plan. The most momentous work that survives in Iran is the Masjid-i-Jami at Isfahan. Figure 1. Details of a squinch in the northern dome (1088/89) providing the transition from the square bay to the circular dome. Islam reached Iran in 637 CE under the banner of Sa'd Ibn Abi Waqqas, a leading companion of Prophet Muhammad (pbuh). This event instigated the amalgamation of the Persian heritage with the new ethos of Islam thus creating one of the most enlightening periods in the history of the region. The Islamic way of life benefited from the Persian adoption of the religion as it absorbed the local skills and achievements into the general knowledge base which provided the foundations of the Muslim civilisation. The Persian heritage contribution may be better appreciated if one considers the enormity of its geographical and cultural legacy which included Central Asia and Afghanistan and the spread towards the boundaries of the Indian subcontinent. In architecture, forms which were developed in other parts of the Muslim world were quickly blended with local styles that were dominated by a skilful use of a diversity of building materials and well developed construction techniques. A delicate Iranian feeling in an essentially Arab style was subsequently produced at an early stage. By the tenth century, local dynasties took control and emphasised their local identity which was manifested by the use of Persian as a literary language. This produced a number of great literary, artistic and architectural masterpieces including the great Shahnamah by Firdawsi at the beginning of the 11th century. Iran made great contributions to Muslim architecture culminating in the introduction of the cylindrical minaret form, the four-iwan plan and according to some sources, the madrasa building schemes. Figure 2. 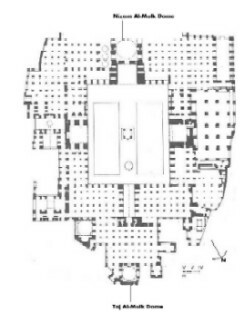 Detailed plan of Masjid-i-Jami' showing the courtyard being inserted in the heart of the large prayer hall (sanctuary) and the four iwans leading to its four sides. The most significant work that survives in Iran is the Masjid-i-Jami at Isfahan. This mosque was initially built by the early Muslims who arrived in the first century after the Hijra (AH). The Abbasids rebuilt it in 840-41 CE in a typical hypostyle plan. The Buyids, who established the first local dynasty, enlarged it between 908-32 CE. 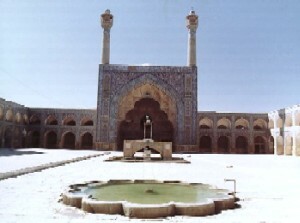 The mosque reached an unprecedented position under the Seljuks who made Isfahan their capital . Much of the rebuilding of the mosque was undertaken by Nizam al-Mulk (1029-1092) who was the vizier of the Seljuk Sultan Malik Shah. This is confirmed by an inscription found in the collar of the large dome over the mihrab stating that it was built for Malik Shah by order of his Minister. Among the many features introduced by Nizam al-Mulk was a large brick dome in front of the mihrab in imitation of the Umayyad mosques. Sources reported that Nizam al-Mulk visited the Great Umayyad Mosque at Damascus in 1086 and on his return he ordered the construction of the dome. This was also the first recorded example of the adoption of the Mihrab dome in iwan plan although the use of such a dome in traditional hypostyle plan was widespread in Umayyad and Abbasid architecture. However, the use of an iwan leading to a domed chamber originates in palace architecture and has been traced by Godard to Sassanid Palaces at Damghan and Kasr-e-Shirin (c. 600 CE) and to al-Mansur's Palace (Baghdad, 762-66) by Salmon. A sister dome was later added (between 1088/89) at the opposite end on the northern axis of the dome of Nizam al-Mulk by Taj al-Mulk, a political rival of Nizam al-Mulk. This dome attained a perfection seldom equalled. The alignment of the walls' decorated panels and the squinches and windows above them expressed an impressive verticality and achieved a structural consonance and a hierarchy of well-ordered parts seen only in the High Gothic period of thirteen-century Europe. Sources indicate that Masjid-i-Jami caught fire sometime during 1120-1121. The fire consumed much of the original mosque except Taj al-Mulk's dome. It was during this time that the hypostyle plan of the mosque was transformed into a four-iwan scheme arranged around a large courtyard. A new mosque plan that was to dominate much of the religious architecture of the Muslim east was therefore born. The iwan can be briefly described as a vaulted hallway leading to a courtyard often taking the form of a monumental entrance. Masjid-i-Jami' emerged as a large complex consisting of a vast prayer hall with a courtyard occupying its heart flanked with four monumental iwans connecting the four sides of the sanctuary. These iwans were arranged in axial plan of equal size and facing each other, except for the southern side where the iwan was deliberately enlarged above the others to emphasise the direction of the Qibla and the presence of the mihrab. Further prominence of this side was expressed by the two cylindrical minarets that were raised on both sides of the iwan by the Safavids. In the following periods further alterations were made including a madrasa added by the Muzaffarids; and a great winter prayer hall and a gate were constructed by the Timurids. Figure 4. 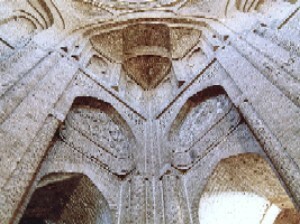 Part of the ribs supporting the dome which are thought to have influenced the gothic rib vaulting. Masjid-i-Jami' is renowned for three particular features. The substitution of the hypostyle plan with the four iwan revolutionised the form and function of the traditional mosque as these iwans were later adapted into study rooms and the sides of the mosque extended to form separate faculties making the mosque into a proper school or university while retaining its customary religious function . This idea later evolved into what became known as the Madrasa. The iwan plan was also adopted for other types of buildings, especially caravansaries, e.g. Ribat Sharaf (1114); hospitals, e.g. the hospital of Nur-al-Din at Damascus (1154); and buildings which spread throughout Anatolia, Syria and Iran respectively. As for the origins of this spatial order, sources traced its first appearance to Sassanian architecture where it functioned as a vestibule leading to the main domed ceremonial hall as found in the Parthian Assur Palace (2nd century CE). At a later stage the plan was employed in houses at Khurasan before being applied to the Mosque and later even to non-religious buildings and palaces. Others suggested that the four-iwan plan evolved from the two-iwan plan, essentially two iwans facing each other across an open court. Such a plan was found in Kuhi Khwaja which has been attributed to the 1st Century CE. Another example was found at the Parthian palace excavated at Seleucia (120-200 CE) which had two iwans opening north and south of the court. The Sassanian example is found at Ardashir Palace at Firuzabad (c. 250 CE). The Masjid-i-Jami remains the earliest adaptation of this plan to Muslim architecture, and later became a central feature of much of the Seljuk architecture in East Asia and Anatolia. Connected with the iwan is the monumental frontispiece that frames the entrance, known locally as the pishtaq. This was also to become a key feature of most monumental gates of the Muslim world. 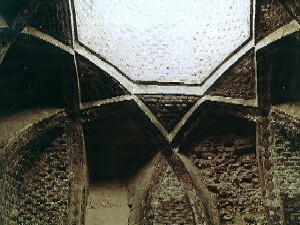 The second remarkable element is the vaulting system employed in the numerous bays of the mosque. There are about 200 vaults, mostly domes and barrel vaults, all of which were made with great skills and craftsmanship which can only attest to the outstanding mastery of brick building and the advanced technical ability attained by these architects, builders and artists. The rib vaulting employed in the domes of the Mosque is perhaps one of the most interesting features of these vaults. As outlined earlier, these domes and iwans were erected between the end of the 11th century and the first half of the 12th century and therefore they are not really the earliest examples. Moorish ribbed vaults of the Great Mosque of Cordoba, Bab Mardum Mosque of Toledo as well as other examples in the Maghreb were certainly much earlier. In fact the Isfahan specimens could have come from the Maghreb. However, Godard and Pope traced their origin to the long Sassanian tradition of vault building. Such techniques were re-employed by Muslim masons in medieval times and are still maintained today especially among villagers. The domes were traditionally constructed with bricks supported by long slender intersecting arches composed of one single line of bricks. The lack of wood in this region is quite understandably the reason behind the invention of such a method. In the opinion of Pope, the domes of the Mosque illustrate the derivation of the European rib. Harvey found a similarity between them and the intersecting ribbed vault with octagonal oculus at the Prior's Kitchen in Durham built in 1366. 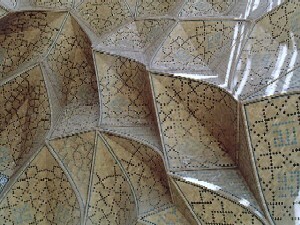 The third element is the large application of muqarnas to decorate many surfaces especially domes and squinches. We find it in the oldest part of the Mosque, in the 11th century Qibla section, on 12th century iwans as well as 15th and 16th centuries Safavid renovation work. The beauty and skill by which these designs were executed deserve credits but their historicity is of greater importance. Although the mosque's example is not the first produced in Islam, as excavation in the Algerian Qala' Beni Hammad (1007) revealed the existence of an earlier version, historians considered these to be the earliest muqarnas employed by the Seljuks. It appears that Seljuk artists had a successful first-hand experience in Masjid-i-Jami as the popularisation and spread of the use of muqarnas became associated with the Seljuks.